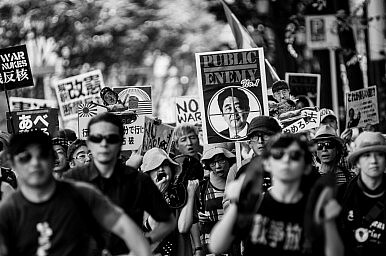 A Tokyo protest against Shinzo Abe on August 2, 2014. [N]ot only opposition parties here, but also the majority of the Japanese population are hoping to see the security legislation scrapped and are urging the government through constant protests to drop the bills and calling for Prime Minister Shinzo Abe to step down. Articles published after the passage of the bills reiterated the strength of public opposition, arguing that Abe and his party had hijacked Japan’s government to ram the bills through. This is a strategy China has been using since the defense reforms took shape – criticizing Abe while highlighting the concerns of the opposition. In an earlier piece, I called it China’s “good cop, bad cop strategy” for dealing with Japan. This rhetoric allows China to fling dire accusations at Abe and his supporters while taking care to point out that the Japanese people as a whole are not culpable. But the abundance of concern for the damage Abe’s legislation might do to Japan’s constitutional system and rule of law is, of course, a mask for China’s own anxieties about the legislation. The two aspects are not unrelated – Beijing views Japan’s post-war, pacifist constitution as an important check preventing its neighbor to the east from becoming a true military rival. By reinterpreting the constitution – and, according to prominent Japanese constitutional scholars, violating it — Abe is increasing Tokyo’s ability to counter, and thus threaten, Beijing. The fact that the security reforms are specifically designed to strengthen the U.S.-Japan alliance is not lost on China, either. State Councilor Yang Jiechi also took advantage of a golden opportunity to express his concern. Yang hosted Shotaro Yachi, the head of Japan’s National Security Council, in Beijing for a rare high-level bilateral talk today (incidentally, the 2014 breakthrough in China-Japan ties came from another meeting in Beijing between Yang and Yachi). At the dialogue, Yang told Yachi that the passage of the legislation “cannot but raise concern and questions from neighboring countries and the rest of the international community on whether Japan will abolish its pacifist posture,” according to Xinhua. Yang also accused Japan of going against the tides of history by speeding up its military build-up and implementing major changes to its security policy.